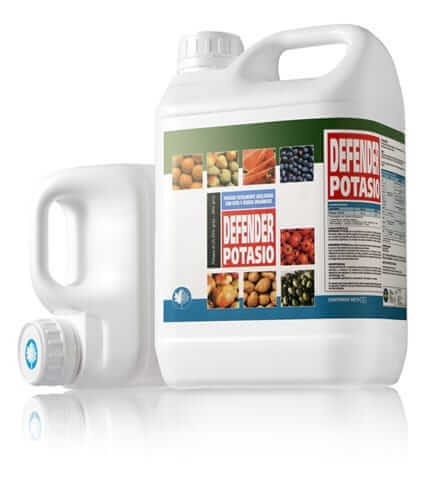 Defender K - Kenya Biologics Ltd.
DEFENDER K contains potassium salts of organic acids that increase absorption and translocation within plant tissue. Use of DEFENDER K improves plant uptake of calcium and magnesium. – Symptoms of deficiency: Chlorosis is evident as visible green or blue-greenish areas on older leaves. Potassium deficient plants wilt on sunny days (suffer hydric stress). Internodes get shorter and young leaves growth is inhibited. – Role of potassium (K): Along with nitrogen and phosphor, potassium isessential for plants. High concentrations of this element are principally found in young tissues, in which it plays an important role in regulating the functions of the plant: potassium improves the resistance against t fungal diseases, interferes with photosynthesis and sugar synthesis, activates drought resistance and plays an important role in transpiration. – Effects on crops: a deficiency of potassium in plantations reduces efficient water usage, resulting in the loss of turgid leaves. Under hydric stress, the tissues reduce their growth rate, causing flabby leaves and smaller plants. DEFENDER K is rapidly absorbed for maximum nutritional benefit. Use in foliar spraying or diluted in irrigation water during vegetative growth, specially in fruit ripening and fattening. DEFENDER K is stable for at least three years since manufacturing date. Keep in a cool and ventilated place DO NOT store for prolonged periods in direct sunlight. Keep away from food, drink and animal feed. Composition is subject to change according to the local regulations for such products. Apply during fruit ripening and fattening stages.